In the next few days, two anti-motorist bills will land on Governor Brown’s desk, for signature, or veto. AB 529. This bill will allow cities to reduce posted speeds by 5 mph, even on streets with a great safety record. The lower posted speed will allow them to shorten yellows, which will increase red light cam ticketing by at least 50%. (Four of the sponsoring cities have red light cams.) Worse, the shortening will increase severe accidents by 30 to 40%. SB 29: This bill is being sold as “red light camera reform” while it actually makes things worse for motorists. For example, it reduces the number of warning signs, from four per intersection under current law, to just one or two. The bill also muddles the current law giving the police only 15 days to get red light camera tickets into the mail. If the authors of this bill were really interested in reform, they would have done something about the fine for rolling right turns, or the 1.5 million cars with “protected plates.” But they did not. Phone Gov. Brown at 916 445-2841, or email him via the form at gov.ca.gov. Ask him to veto AB 529 and SB 29. Also phone your union or professional association. More details about these bills are at the top of my Action/Legis page, at: http://highwayrobbery.net/redlightcamsjoin.htm . I can’t tell you how many times a client has come in with little or no information about the car accident they were just involved in. If you are involved in an auto accident, obviously the first thing you need to do is worry about your health. Make sure you call 9112 if you suspect any injuries. If there is anyone in the car that is experiencing neck or back pain from the accident, and if there is no immediate threat by staying in the car, try to stay in the car and do not move your neck. The fire department / ambulance will evaluate you. Make sure you let the 911 operator know that there is someone injured so that they will not only send the police but an ambulance as well. You may be transferred to a second operator. The first operator being the police, and then the second one being the fire department. In the City of Los Angeles, the first call taker is a police dispatcher and they gather some basic information and will then transfer you to the Los Angeles Fire Department Operator who will give you “pre-arrival” instructions and will likely advise you not to move any injured people. What are the important items I need to get regarding the accident? If there are multiple other cars, add all information for additional cars. Pictures of the scene as well as the damage to both cars. Too much information to handle? Use our handy smartphone mobile site that will assist you in gathering the information www.exchangeinfo.info This tool has all the necessary fields that you need to fill out. Once complete, it will send all of the information for my office for review. Please note: The questionnaire on www.exchangeinfo.info is meant solely for the use of the consulting attorney for purposes of analyzing and evaluating the prospective client’s case. Although the information you supply is strictly confidential, submission of this form DOES NOT CREATE AN ATTORNEY / CLIENT RELATIONSHIP. If you or someone you know has been involved in any tyoe of accident, contact the Friedman Law Offices today! DO NOT DO AS SHOWN IN THIS CARTOON! 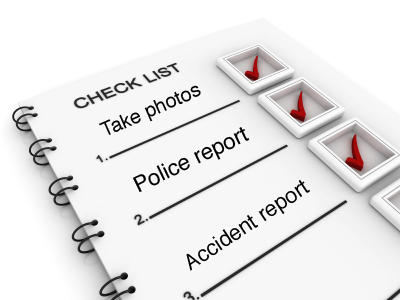 What information should I get at the scene of an accident? Do I have a right to make a claim against the negligent party’s insurance? Do I have a right to sue the negligent party? Will my “status” be affected by making a claim or filing a lawsuit? These are all common questions. However, California courts have held that the immigration status of a Plaintiff is “irrelevant” and therefore considered, inadmissible evidence. The only time the citizenship status would be admissible is if the Plaintiff was trying to submit a “loss of earnings” claim and the Defendant tries to show that there were never any payments made, as the Plaintiff wasn’t even legally allowed to be paid in the United States. Any potential prejudice that might result from the introduction of the plaintiff’s status as an illegal immigrant can be overcome by a curative instruction by the Court. Certainly, a plaintiff would be entitled to a limiting instruction that his status as an illegal immigrant is not relevant on the issue of liability. There are many intricate details and considerations that go into filing a personal injury claim and/or personal injury lawsuit. Make sure you speak to a lawyer at the Friedman Law Offices as soon after the injury as possible. Call us at 323-596-1234 so we can preserve your rights. What is Uninsured or Underinsured Motorist and Why Do I Need it on my Insurance Policy? Someone hit your car but their insurance lapsed and they have no coverage. You have been seriously injured by another vehicle and accrue tens of thousands of dollars in medical bills. The other party carries the minimum liability insurance of $15,000. So what do you do when the party at fault has no insurance? You can choose to personally sue the individual at fault (if you can find him/her). OR rely on your uninsured motorist coverage to handle the claim. In any of the above scenarios, if you carry uninsured/underinsured motorist coverage, your own carrier should pay you for your damages, which includes pain and suffering. There are so many people driving the streets that do not carry even the minimum insurance required by the law, so be smart and carry uninsured motorist coverage on your auto policy. At the Friedman Law Offices, we know the ins and outs of the “uninsured/underinsured motorist” laws. If you have been injured as a result of a hit and run driver or uninsured motorist, be sure to contact the Friedman Law Offices as soon as possible so that your rights will be preserved and so that we can get you the maximum recovery possible. What is a “Personal Injury”? A Personal Injury, also known as “P.I.” is when someone is injured as a result of someone else’s conduct. The other person’s conduct can be accidental, negligent, or intentional. A personal injury can also result from someone else’s non-action. The most common types of personal injury claims are traffic accidents, accidents at work, tripping accidents, accidents in a home you own or rent, product defect accidents (product liability) and holiday accidents. Traffic accidents include injuries that occur when traveling in a car, motorcycle, bicycle, train, plane, or even while walking as a pedestrian. 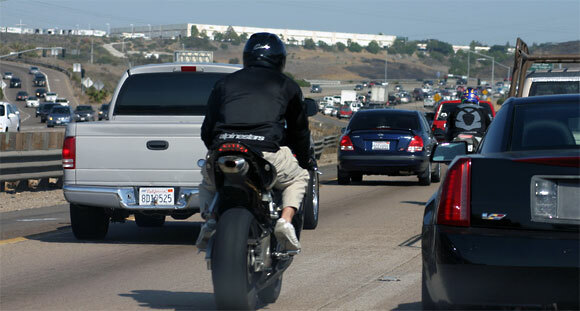 Virtually any type of transportation related accident falls under the traffic accident category of “personal injury”. The term personal injury may also incorporate medical and dental accidents or negligence (which lead to numerous medical negligence claims every year). However, most law firms have separate “specialties” that distinguish between “personal injury” and “medical malpractice”. If the negligence of another party can be proven, the injured party may be entitled to monetary compensation from that party or from that party’s insurance carrier. Most traffic accidents, although not caused intentionally, has an “at fault” party. For example, if a driver rear-ends the driver in front of him, the rear-ending driver is usually the one “at fault”. 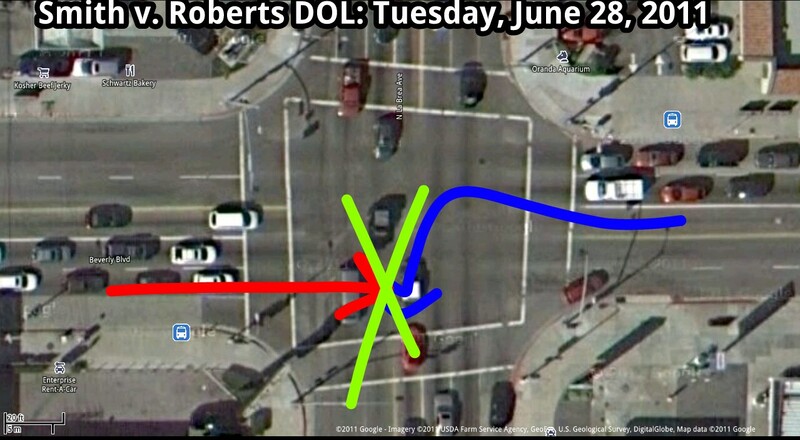 Another example would be when Driver A runs through a red light while Driver B was proceeding through a green light and the collision occurred in the intersection. Obviously, unless there are some other extenuating circumstances, the driver running the red light will be “at fault”. Attorneys usually represent a client on a “contingency basis”, in which the attorney’s fee is a percentage of the plaintiff’s eventual compensation, payable when the case is resolved. This enables a client that may not otherwise have the funds, to pursue a “case” and get the necessary medical treatment. Victims of auto accidents may be able to visit a physician, doctor, or therapist on a “lien basis”. This means that the doctor would agree to examine and treat the client without being paid until the case is resolved. But why can’t I go directly to my doctor and insurance and leave the attorney out of it? Oftentimes, having an attorney becomes essential because cases become extremely complex. Moreover, although the insurance companies claim to be on your side, they really put their interests first. When dealing with your own insurance company, it may be easier for them to classify the case as “50/50” liability (meaning that both you and the other driver are “at fault” equally). Insurance companies benefit for two reasons: 1) They can close the file sooner. 2) If you are found to be partially at fault, they can raise your insurance rates. Although they may have to pay for the other party’s damages in a 50/50 case, they may make that money back in insurance premiums. If you retain a law firm that specializes in auto accident cases, this will decrease the chances of your insurance finding you “at fault”. Another reason to “retain” an attorney is because an attorney can get you monetary compensation above and beyond what is paid to the doctor and the attorney. Almost every person involved in an auto accident experiences what is called non-economic damages, specifically, pain, suffering, inconvenience and the like. Some cases have more non-economic damages than others. However, almost all cases where the client is found not “at fault”, the attorney will be able to recover money for the least enjoyable of circumstances, that is the pain of dealing with the car accident. Aside for compensation from injuries, the injured person can also get compensated for how the injuries have affected his or her life, such as, a casual tennis player suffers a wrist injury which prevents him from playing tennis. This can be compensated for over and above the award for the injury itself. This is called loss of amenity, and the award for loss of amenity is part of the claim for pain, suffering and loss of amenity. In the same manner, the injured person can also be compensated if, as a result of the injuries, he was unable to work. This is called loss of earnings. Experienced attorneys have several strategies in obtaining the maximum compensation for their client. However, most clients don’t want to wait around for many months and especially not for years until they get the money that they deserve. The attorney should discuss all settlement options with the client in order to expedite the settlement or judgment of the case while making sure that the client will obtain the most favorable outcome. One must understand that in California there is a statute of limitation for injury cases. If settlement is not reached, a lawsuit must be filed against the “at fault” party within two years of the accident. Other examples of personal injury accidents include: slipping and falling in a market, tripping at a gas station, having a heavy item fall on you in a hardware store or being bitten by a dog on private or public property. There are many examples of when an attorney can help you receive the most compensation for your injury. If you are the victim of a personal injury, you should contact a personal injury lawyer in Los Angeles as soon as it is possible to do so and avoid discussing the matter with strangers and/or insurance representatives. You should be cooperative with the police and your own treating physicians. Remember, there is always an in-person free case evaluation consultation available to you with an attorney. Speak to an attorney at the Friedman Law Offices today! Call us at 323-596-1234. If you or someone you know has been involved in a motorcycle accident, after taking care of your imminent medical needs, it is extremely important to seek advice from a personal injury lawyer. It is also advisable to seek an attorney who truly understands what goes on in the mind of a rider – someone who is/was a motorcycle rider. I started riding in 2004 and will ensure that your rights are protected. Please contact the Friedman Law Offices by filling out the online form or calling us at 323-596-1234. It is important to call as close to the time of the accident as possible. Remember, no attorney fee is ever taken unless we get you the money you deserve! My name is Ari Friedman. I am an attorney specializing in Personal Injury practicing together with my father in Los Angeles. In an effort to move our clients’ files digital, we have recently been scanning files. However, it is still a tedious job scanning every paper coming in. With the help of my new Android tablet, I’ve saved countless hours of work and taken organization to a new level. In this brief article I will explain which applications help me run my business more efficiently. Instead of reviewing each app I use one at a time, I will run through it in chronological order. I am hoping that this article will assist people from all types of professions. Since most of my cases that come in are a result of car accidents and motorcycle accidents, I need to better understand the scene of the accident. First, I open Google Maps and I zoom in to the scene of the accident using Satellite view. I activate the screenshot, then “share” to Picsay Pro. Once in Picsay Pro, this is where the fun starts. I use the drawing tool to start drawing on top of the scene .jpg. I indicate where and what direction my client was going as well as for the other party/parties. I crop the image to my liking, throw on the title of the case, save it, then “share” to the appropriate client folder on Dropbox. I also keep a hard-copy of all items, therefore, this must be printed as well. To do this, I “share” to “Cloud Print Beta” and the scene .jpg is printed. When opening a new case there are a number of documents that must be filled out and signed. After trying a few of the PDF annotate apps out there, I’ve chosen EZPdf Viewer. 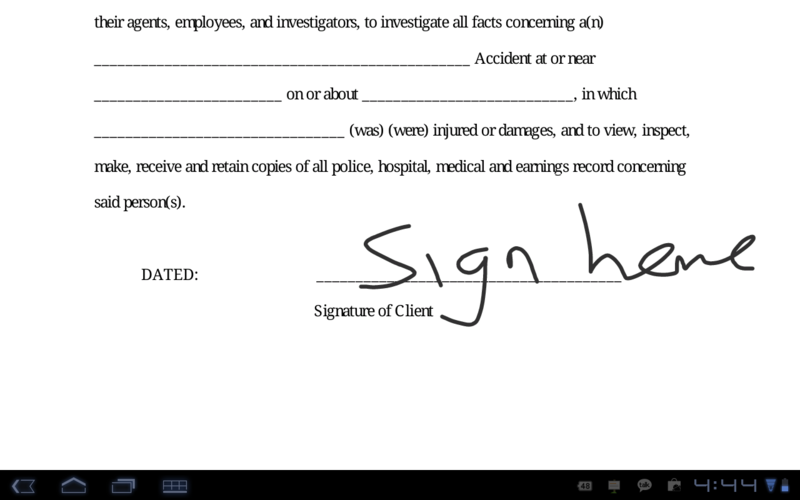 It lets me highlight, add text boxes, and most important, use freehand – for signatures. 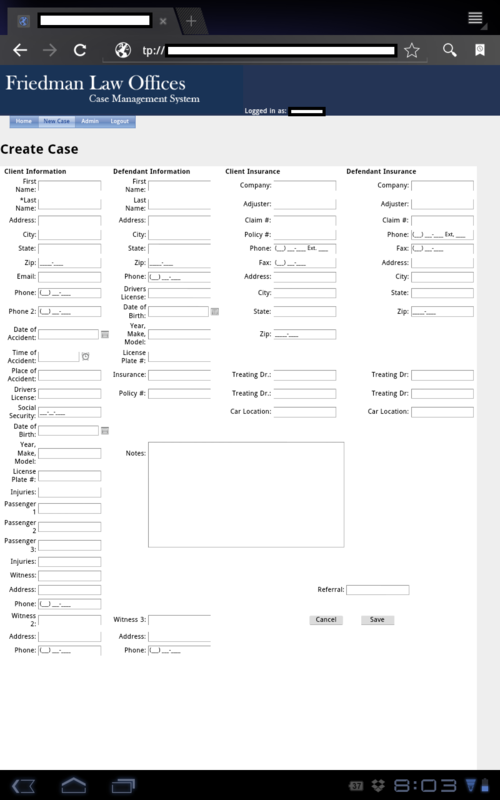 My client information database (custom created for me by Pandioncorp) consists of an encrypted web based form, formatted perfectly for a PC as well as for mobile browsers. No law firm is complete without quick access to the states statutes. 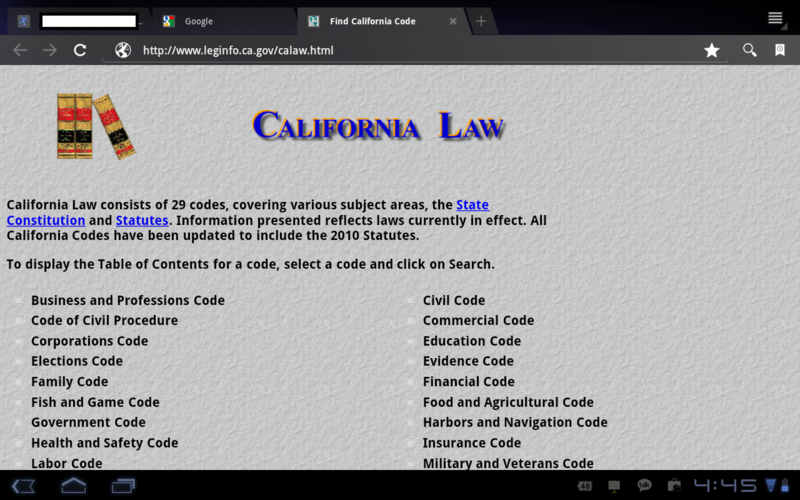 There are apps available, but I find the California Legislative Information site to be very easy to use on Android’s native browser. 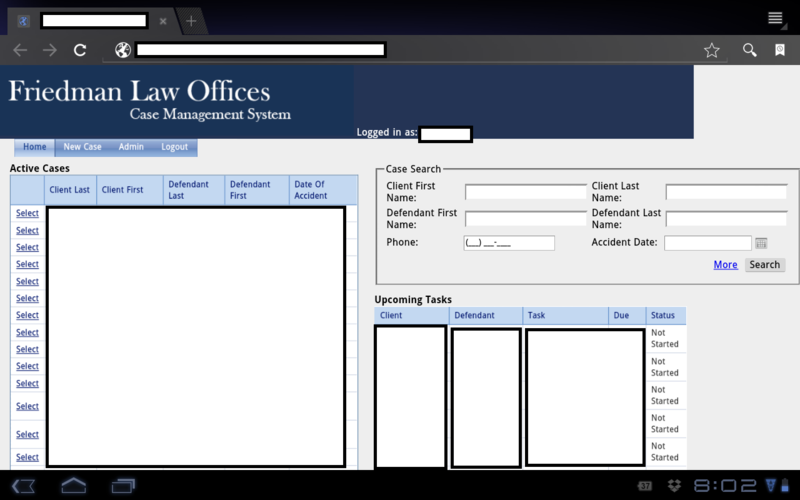 My client database system keeps track of all of my cases and has a reminder window. This is the default screen that my tablet stays on when not using another application. I work together with my father who has been an attorney in the field for 40 years. While we focus on the traditional practice of law, I am constantly looking to bring new and innovative techniques into the firm. 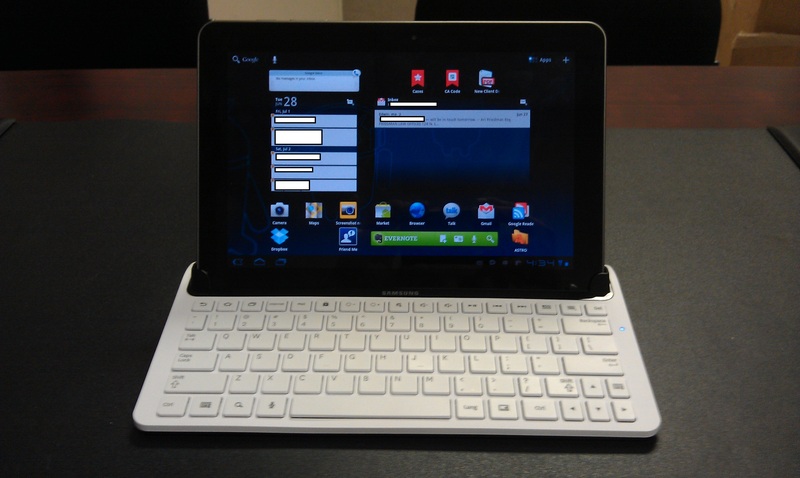 I’ve always kept my Android playtime separate from work, however, with my Android tablet, the possibilities are endless. Merging the two together enables me to take notes while making direct face to face contact with my client, increases productivity and efficiency, that brings an overall better experience for the client and the firm.